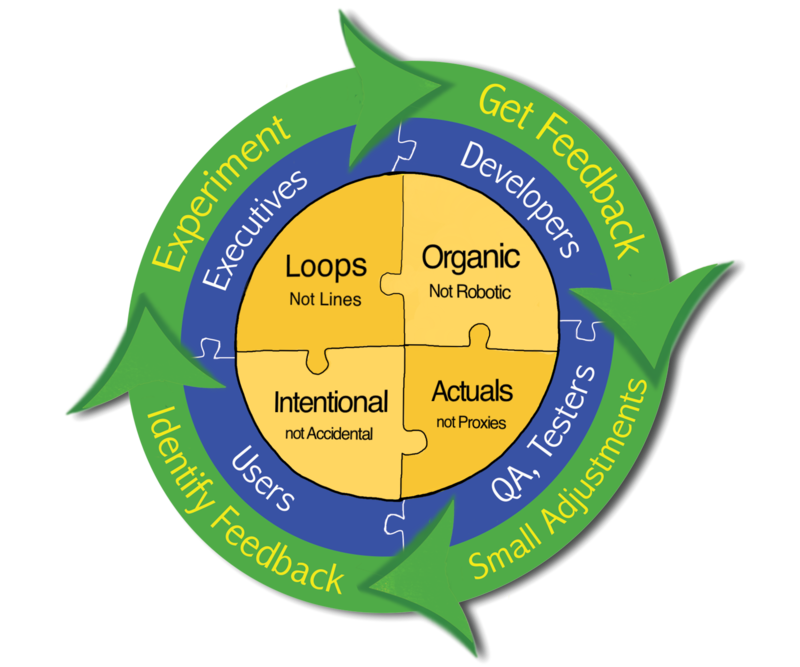 Tight Feedback Loops: for both process adoption and technical questions, GROWS uses a cycle of Identify Feedback → Perform an Experiment → Get Feedback → make Small Adjustments, all in in a very short time frame. Everything in GROWS is driven by experiments and feedback, including software development and delivery, process adoption and pruning, and individual, team, and organizational learning. All-Inclusive: GROWS is a way of working together for everyone, including Executives, Developers, QA, Testers, Analysts, Designers, Users… everyone has a part to play, and everyone depends on everyone else to achieve our common goals. GROWS uses feedback practices to help ensure that we’re building the right thing, that is, the thing the Executives and Users actually need (which may or may not be what they thought they wanted). Engineering and technical practices help grow the team to use modern software engineering techniques that shrink the feedback gap to be within short-term memory, minimizing risk and maximizing efficiency. So many aspects of development are not predictable, but a regular rhythm of development and continuous delivery becomes reliable. A stable rhythm keeps everyone motivated, reduces the feedback gap and thus reduces organizational risk.